Tucked away behind Oxford Street, Gaylord is part of an international chain of Indian restaurants with an enviable reputation for quality and service. Established since 1966, this is one of the first Indian restaurants who introduced the tandoor and Mugali specialities in London. The menu includes the usual favourite, as well as signature dishes, such as spiced quails. 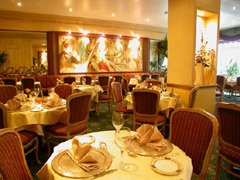 The restaurant is large and pleasant with tables well spaced. The large mirrors, the pleasant paintings of Indian characters on the walls, the plants and ornaments, and the courteous staff successfully create an environment of the royal India; in which you eat and feel like a Maharaja. The prices are above the average high street Indian, although not over the top. Gaylord was the lunching pad for the 'All Parliamentarian Tiffin Club' in London, which is formed by over 50 British members of Parliament, cutting across party-lines, whose aim is to select the best South Asian restaurant in the United Kingdom every year and to boost charitable causes. Fitting a party of 100 (seated), and a short walk from Oxford Circus, it certainly is a suitable venue for all types of parties. The restaurant also provides outside catering and is approved caterer to a host of reputable venues and hotels in London including Hilton, Marriot and Inter-Continental hotels. There is also a take-away service available. Serving North Indian cuisines, the highlights are tandoori specialities, and delicately prepared curries with distinct characteristics of their own. There is an extensive vegetarian menu with a good selection of Paneer dishes which appeals to non-vegetarians alike. Equally good choices of desserts for a sweet finish.